Surfboard design! When you are just starting out as a surfer it will probably take you some time to figure out what kind of board you want to ride. Unless you have a bevy of friends who want to loan a newbie one of their prized possessions you have two options. The first is to rent equipment. It will probably be limited in scope but it will allow you to get a feel before you throw down too much of your cash. Secondly, watch as many surf videos as you can. Different boards are made for different styles of surfing so if you have a good idea in your mind of what your surfing style would be after watching you can buy the right type of board. Keep in mind, when you are just learning you do not want to spend a lot of money on your first board. The nuances that an experienced surfer spends the money for are missed by beginners. So save the money until you get more experience in and can appreciate the investment. Your first board will probably take and give its fair share of abuse, so invest in a nose guard as a beginner. Those surfing around you as you learn will be grateful. 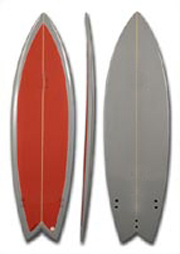 The surfboard design of a shortboard ranges anywhere from about 5-9 feet, with most of them being in the 6-7 foot range. They are designed for high performance and maneuverability. Which makes them unsuited as a beginning board. The smaller size and squirrelier movement which make for great carving speed and turning ability mean that a beginner will have difficulty with the amount of floatation and the ability to paddle well. And the ability to stand up. Waiting until you have more experience to buy your first shortboard is recommended. Trying to learn on a shortboard is a recipe for frustration. After a year or so, you can adapt to the board much better. A soft top surfboard is exactly what it sounds like and is the ideal board for most people to learn on. 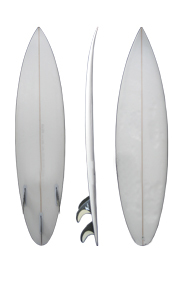 The top and rails are softer than fiberglass surfboard design, which is what makes them great for beginners. They are usually good for the skill level of beginners for your first year or so on the water. You are much less likely to injure yourself or another surfer on a soft top. Although a thunk in the head will still have you seeing stars. You are also less likely to damage another surfer’s board with a soft top. Which means they will probably be a little more welcoming in the water when they see you on a soft top. The soft surface means they don’t ding as easily, so when you graduate to a shortboard you can sell your soft top to another beginner and recover some of the money you spent. With a name like that they must be fun, right? Exactly. And they are great second step after a soft top board. They have enough floatation and stability for someone that is still fairly new, but enough maneuverability for someone who is gaining skill. A funboard is something you can keep around for a long time too. Whether you decide that you want to head towards long boards, short boards or have the full spectrum, falling back on a funboard is something you can always do. When you go to find your funboard make sure that you get 6 oz glass rather than 4 oz, because it won’t ding as easily. The surfboard design of a longboard is similar to a soft top board but when a board is over 9 feet long it qualifies as a longboard. Most experienced surfers have at least one longboard, even if they mostly surf shortboards. They are the veterans version of a funboard. Just about everyone loves to ride them. They are easy to paddle and very stable. That being said, they are not the perfect choice for a beginner. Just as a beginning driver couldn’t parallel park an 18 wheeler, beginning surfers can not properly turn longboards. This makes for a danger alert. When you can make the progression from soft top to funboard and them to longboard, it’s time to add a big gun to your quiver. 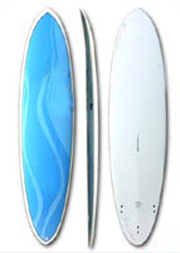 The surfboard design of a fish tail originally modifies from a kneeboard design in the 60’s by Steve Lis. The fish tail is exactly what it sounds like. The tail is indented the same way that the tail of a fish is, shorter in the middle and longer near the edges. What does this design do? It gives the ability to do roller coaster style turns at high speed. Very high speed. It does not adapt well to pivot style turns and will put the brakes on if you try it. This is a board for experienced surfers with at least a few years of time in the water. They are extremely short in comparison to other boards. 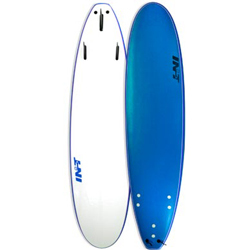 The combination of speed capability based on the tail design and maneuverability quirks because of the shaping mean this is a board for the surfer who has earned her stripes. 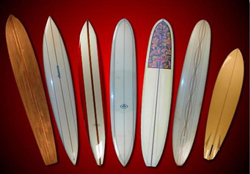 Epoxy surfboard design came out in the 70’s, but they didn’t catch on until 90’s when Surftech developed their tuflite models. 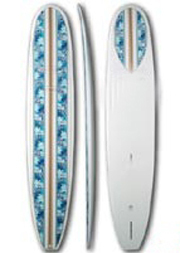 You can get epoxy surfboards in just about every style and shape. But you should definitely have enough experience in the water to know exactly what that shape is because these boards will cost more than fiberglass. They will also last for years. Their toughness means fewer dings, less damage and less damage to anyone else’s board. One advantage for beginners if you know the shape you like is that epoxy boards are lighter and have better floatation then fiberglass boards. And if you get thunked in the head with an epoxy board it will hurt just a little bit less than with a fiberglass board. The epoxy boards have a tighter flex, which as a beginner you probably wouldn’t notice. The same kind of difference between a carbon fiber tennis racket and a ceramic. When you have a lot of experience you will probably want both an epoxy board and a fiberglass board depending on the conditions. 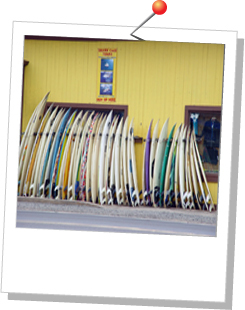 Just as in fashion, surfboards must have special characteristics to actually be classics. Simply being an old surfboard design does not qualify a board as a classic. You want to avoid anything that is simply an old school replica. A classic becomes a classic because it rides well for years and years. The breakthrough tri fin thruster from Simon Anderson is one of the most influential designs in a board in surfing history. Skip Frye’s twin fin fish, for smooth arcing turns, was not only incredibly innovative, but is still popular today. Al Merrick’s designs are what you would call modern classics. Used by professionals and amateurs around the world and consistently ranking as favorites. Remember when looking at classic designs or classically inspired designs. Just because it’s old doesn’t mean it’s classic. Retro chic works on many fronts, but in your board you want performance.